The vineyards of Margaux’s Château Dauzac, where they are using powdered Atlantic algae to treat mildew and botrytis. 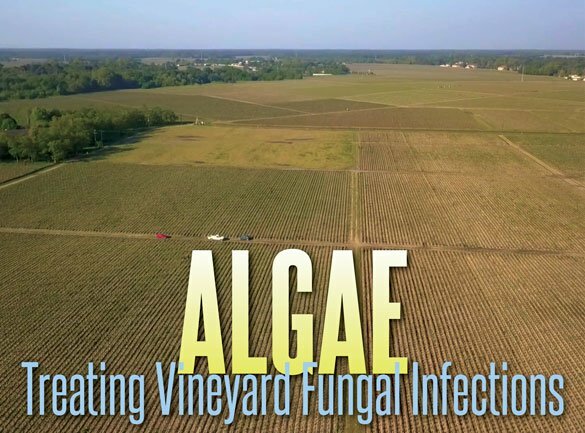 ophie Kevany writes in Decanter.com that a group of vineyards in France’s Bordeaux and Cognac regions are exploring whether algae can be used to prevent the fungal infections mildew and botrytis, both posing significant problems to their grapes due to the region’s warm, damp conditions. While the traditional copper solution (known as “bouillie bordelaise”) is effective against fungal outbreaks, some producers have concerns about its toxicity and have long been looking for an alternative. Enter algae. For the last three years, engineer and oenologist Laurent de Crasto has been working with Lionel Navarro, a researcher with France’s National Centre for Scientific Research (CNRS), to test a treatment using powdered Atlantic algae. Having started with a test plot, Mssr. Fortin is now using the algae on all Dauzac’s biodynamic-certified plots, currently about three quarters of the estate. Results to date, he says, show a 100% success rate against mildew, and 50% against botrytis.